What do the beauty and color of flowers, the tastes and variety of food, the innocence and liveliness of children, the speed and mettle of horses, the heroic deeds of noble men, and the goodness of the human heart all share in common? They all dwell in the original wonder book of God’s handiwork and Mother Nature’s creation. Indeed as Hopkins writes in “God’s Grandeur,” “There lives the dearest freshness deep down things”—an idea that also infuses Hawthorne’s version of six of the most famous classical myths. In this most imaginative yet faithful version of these ancient tales, Hawthorne depicts the mystery, miracle, secret, or hidden power that lives deep down things. Whether it is the glory of the fall or the purity of the snow, the perfume of flowers or the deliciousness of food, the greatness of noble men or the sweetness of children, A Wonder Book depicts the inexhaustible riches of creation teeming with goodness and beauty in a myriad of forms. Man himself is one of these chapters in the wonder book. In “The Three Golden Apples” Hawthorne portrays not only the extraordinary physical power of Hercules performing his famous Twelve Labors like chasing a stag for twelve months but also the spiritual power of patience, tenacity, and determination that Hercules shows in wrestling the Old Man of the Sea and in traveling across the ocean in a cup to retrieve the apples. In “The Gorgon’s Head” Hawthorne describes the amazing feat of Perseus who kills and beheads the Gorgon by uniting his powers of mind and body, by exercising the boldness of Quicksilver and the prudence of Athena to conquer the monster whose gaze turns men into stone. In “The Miraculous Pitcher” Hawthorne captures the profound goodness of the human heart epitomized in the hospitality of the elderly couple of Baucis and Philemon who welcome all strangers as if they were gods in disguise deserving of the best gifts a host can offer a guest. Baucis and Philemon’s generous kindness inspires the Greek gods disguised as beggars to proclaim, “You, with your scanty means, have mingled so much heartfelt hospitality with your entertainment of the homeless stranger, that the milk became an inexhaustible fount of nectar, and the brown loaf and honey were ambrosia.” To repay the kind couple for their overflowing hospitality, the gods reward them with the miraculous pitcher that always replenishes itself when emptied to the last drop—a symbol of the wonder of the human heart whose love knows no limits. C hildren are another chapter in the wonder book. Hawthorne gives the children in the book who hear Eustace’s stories the names of flowers: Primrose, Periwinkle, Sweet Fern, Dandelion, Buttercup, and Sweet Fern. Flowers that adorn the world with their abundance, variety, color, and fragrance resemble the exuberant energy of children “full of life” who also beautify and enrich the world as they evoke the freshness of the paradise of innocence before Pandora opened the forbidden box and released the Cares, Sorrows, and Troubles that robbed the unspoiled world of its purity. 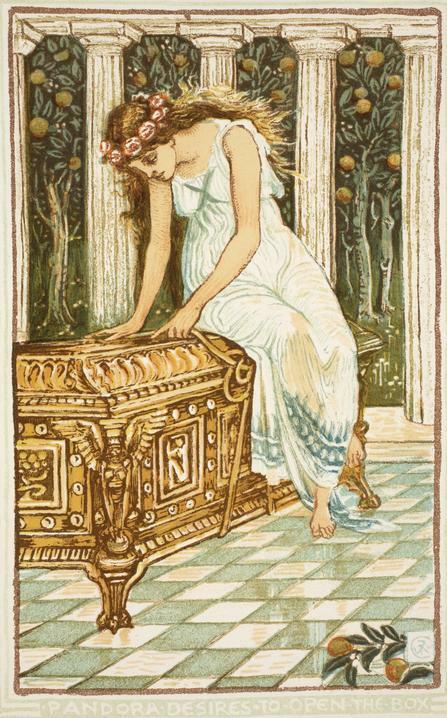 Eustace narrates this myth in the background of the snowstorm “when the world was as new as Sweet Fern’s brand-new humming-top” and when the world enjoyed but one season, “the delightful summer.” Although Pandora’s curiosity ended the paradise of children, the last creature to emerge from the box is the beautiful being called Hope described as “a cheery little body” with wings “colored like the rainbow” to remind man that “Hope spiritualizes the earth; Hope makes it always new” and hints “of an infinite bliss hereafter”—the character of Hope bringing the same cheer, purity, brightness, and newness into the world that flowers and children also signify. In “The Chimaera” the two children who see with fresh eyes and rapt wonder lead the mighty Bellerophon to find the winged horse Pegasus that no one else remembers or believes to exist. While a jaded middle-aged farmer regards horses in terms of mere horsepower that plows fields and a skeptical old gentleman has no memory or belief in Pegasus, a boy and girl full of wonder testify to the reality of the winged horse because the girl heard him neigh and the boy saw his reflection in a fountain. As the children with their hearts and shining eyes behold the wonder of the glorious horse (“never was any sight so beautiful as this, nor ever a horse’s eyes so wild and spirited as those of Pegasus”), they also testify to the “dearest freshness deep down things” that reveals the invisible things of God by the things that are visible.